There was a health and fitness fair in the Old Market Square today. Some interesting stalls. I actually chose a small tub of fruit over a cream cake from one of the healthy eating stalls, which I thought was remarkable of me, as I love cake. 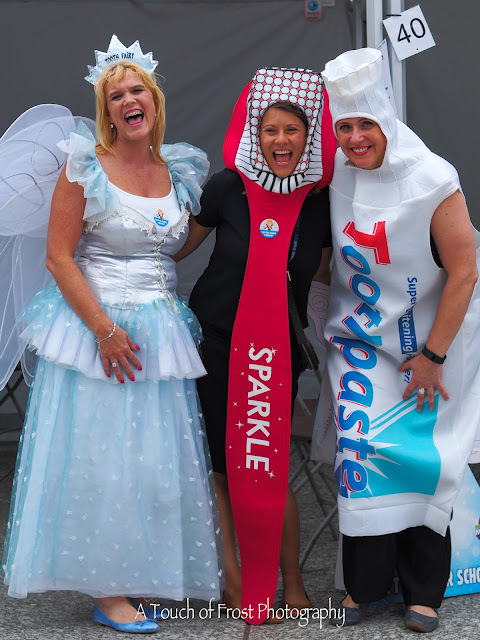 Then I saw these three ladies dressed as the Tooth Fairy, a toothbrush and a tube of toothpaste, as they were promoting looking after your teeth So I just had to take a photo of them for the blog. They must have been friends, as they seemed to be enjoying the experience of dressing up and becoming another character. I am always hopeful that I come across 'characters' when I visit such events, as taking photos of stalls isn't usually very exciting. What's On His Mind Then?